Favourable global economic prospects, particularly strong momentum in the euro area and in emerging markets led by China and India, continue to serve as a strong foundation for global financial stability.” This statement opened the International Monetary Fund’s April 2007 Global Financial Stability Report. Since this benign view was published on the eve of the most devastating financial crisis in nearly eight decades, it has to be viewed, in hindsight, as a spectacular misjudgment. The fund is determined not to be caught out again. The question is whether the concerns it pours forth in its latest Global Financial Stability Report are well judged or whether it is crying wolf. As important, what might be the implications, especially for policy, of its worries? The underlying argument of the report is that “near-term risks to financial stability continue to decline”, but “medium-term vulnerabilities are rising”. The return of global economic growth, combined with comfortable monetary and financial conditions, together with sluggish inflation, strengthens investors’ reach for yield and appetite for risk. With market and credit risk premiums at decade-low levels, asset valuations are vulnerable to a “decompression” of risk premiums — in blunter words, a crash. As the report notes, shocks to credit and financial markets well within the historical range could have large negative impacts on the world economy: “A sudden uncoiling of compressed risk premiums, declines in asset prices, and rises in volatility would lead to a global financial downturn.” Many hold the room for monetary policy manoeuvre to be limited. The result might then be a less deep, but still more intractable, global recession than that of 2009. Possibly most important, leverage continues to rise across the world, notably in China. In the high-income countries, the net asset position of the private sector has improved somewhat since the crisis, but the governments’ has worsened. Moreover, assets are currently valued at high, quite possibly unsustainable, levels. Debt service burdens are generally low, at current interest rates. But this would change if those rates rose sharply. Moreover, in several economies debt service burdens in the private non-financial sectors are greater than average — notably in China, but also in Australia and Canada. Such analyses bring worries into the open. This is helpful: the more worried people are, the safer the system. Yet it is also essential to tease out the implications of the fragility the fund describes so clearly. I would identify four. First, investors must be very wary. Second, it has to be possible for the financial system to cope with changes in asset prices without blowing up the world economy. This should not need saying. An essential part of achieving this is deleveraging and in other ways strengthening intermediaries, notably banks. That has indeed happened, but not, in my view, nearly enough. Third, the generation of demand sufficient to absorb potential supply has become far too dependent on unsustainable growth in credit and debt and also on consumption (especially in high-income countries) or wasteful investment (as in China). We might break this linkage in several ways. One is to redistribute income, via the tax system, from savers to spenders. Another is to increase incentives for investment, especially by profitable businesses. Another is to remove the tax-favoured position of debt and rely more on equity financing throughout the economy. A final one is to rely more on government spending and borrowing, especially spending on public investment. Finally, we should not conclude that central banks have to abandon the priority of stabilising the economy in favour of the possibly conflicting goal of stabilising the financial system. One reason is that monetary policy is a blunt instrument for achieving the latter. A more fundamental objection is that we cannot tell people they must remain stuck in a deflationary economy because it is the only way to stop the financial system from exploding. They will rightly respond that these priorities are wrong. Similarly, ensuring creditors get the returns they think they deserve is not the job of the central banks. If governments think creditors are so deserving, they should change taxes accordingly. Again, if they think the financial sector remains excessively unstable, they should regulate it. Criticising the success of our central banks in reflating our crisis-hit economies, because this created today’s financial risks, is not a valid reaction to their actions. It is, however, an extremely valid criticism of finance. It is also a valid criticism of the failure of governments to address the many frailties that still lead to financial excess. The central banks did their job. Unfortunately, almost nobody else has done theirs. FOR a moment it seemed China was reverting to Maoist economic management. On the sidelines of the Communist Party congress this month, an official told Xi Jinping that her village distillery sells baijiu, a potent spirit, for 99 yuan ($15) a bottle. Mr Xi, China’s most powerful leader since Mao, remarked that this seemed a bit dear. The chastened official thanked him and pledged to follow his guidance. But Mr Xi gestured her to stop. “This is a market decision,” he chuckled. “Don’t cut the price to 30 yuan just because I said so.” The audience, perhaps relieved that Mr Xi had no intention of dictating the price of booze, broke into laughter. This rare spot of levity at the dreary five-yearly congress was telling. The occasion cemented Mr Xi’s unrivalled position at China’s apex. For companies, the question is what he will do with it. His vision can seem ominous. “North, south, east and west—the party is leader of all,” he intoned in a speech laying out his plans. On his watch the party has already reasserted control over state-owned enterprises (SOEs) and sought influence in private ones. It has called on entrepreneurs to be patriotic. And regulators have cowed swashbuckling businessmen, from Wang Jianlin, a property mogul formerly China’s richest man, to Wu Xiaohui, an insurance magnate who fancied himself the next Warren Buffett. It might seem as if Mr Xi is turning the screws on private enterprise. But “socialism with Chinese characteristics” has long had a contradiction at its heart. 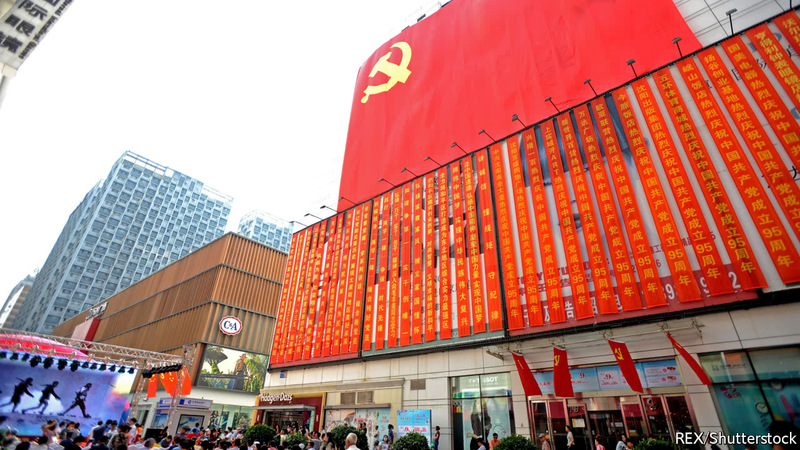 Across much of the economy, Communist officials preside over rumbustious capitalism. Mr Xi’s pledge of a “new era” probably means more of the same rather than a relapse to central planning. Take the clampdown on moguls. Regulators have chosen four of China’s most acquisitive companies for extra scrutiny: Anbang, an insurance firm; HNA, an aviation-to-tourism group; Wanda, a property developer; and Fosun, an industrial conglomerate. As a result, their frenetic overseas investments have slowed sharply this year. Wanda has sold many hotel assets. Anbang’s founder has been detained. Yet this is not the assault on entrepreneurs that some make it out to be. 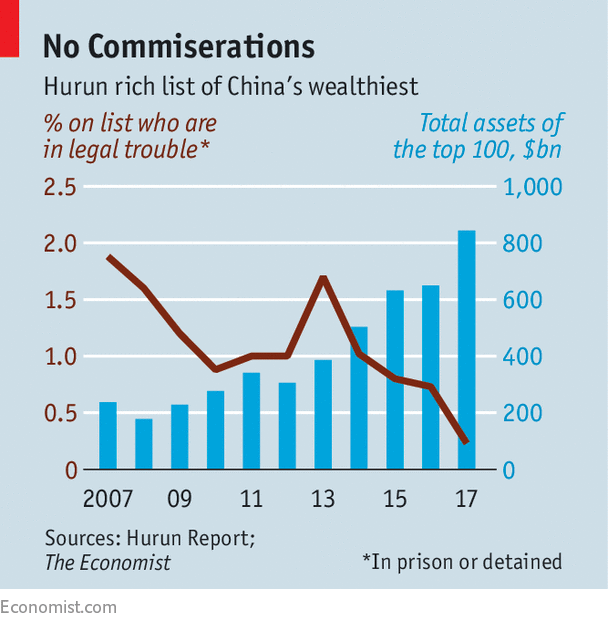 Of the 2,130 people on the Hurun rich list, a guide to China’s ultra-wealthy, just five fell foul of the law last year (see chart). By comparison, Mr Xi’s anti-corruption campaign has ensnared nearly 10% of the party’s 205-member central committee in five years. Restrictions on the four high-flying companies are best seen as a by-product of stricter financial regulation, says Joe Ngai of McKinsey, a consultancy. Belatedly, officials have taken a hard line on risky funding, especially for overseas acquisitions. At the same time, the fortunes of tycoons with businesses geared to the domestic market—in tech, property or manufacturing—have soared. Wealth on the Harun list has more than doubled under Mr Xi. Another concern is tightened control of the technology sector. The Wall Street Journal reported this month that internet regulators might take 1% stakes in social-media giants, including Youku, Alibaba’s YouTube-like platform, and Weibo, China’s answer to Twitter. But the government already has a good handle on its tech superstars. None can get far in China if it angers the party or turns down data requests from state security. And they already serve up party-pleasing products. Some are lighthearted, like Tencent’s game for WeChat, its ubiquitous mobile app, letting users compete in “applauding” Mr Xi’s speech by tapping their phone screens. Others look more sinister, such as techniques to monitor users, which can help authorities keep tabs on citizens. The notion that Mr Xi is stifling innovation is belied by a flourishing of enterprise. Only America has more, and more valuable, startups. Media focused on the party instruction for entrepreneurs to be patriotic, but the directive mostly spelled out how the government can support them. Gary Liu, president of the China Financial Reform Institute, says the real message is that entrepreneurs are vital to the economy. A final concern is Mr Xi’s wish to strengthen the party’s clout in the corporate sector. Hundreds of listed SOEs have amended their articles of association since he took office, vowing to consult party committees on big decisions. The regulator which oversees tech companies last year ordered them to improve their “party building” activities. The party wants members to be placed in more important jobs. Tencent now employs some 7,000 party members, or 23% of its staff; it says that 60% of them are in key roles. But this is not entirely new. After mass closures of SOEs in the 1990s, officials pressed private firms to set up party organisations. As far back as 1999 nearly a fifth of foreign-backed companies had one. There is scant evidence that party cells have tried to sway firms’ big decisions. Companies may not like them but the cells do not hurt business. Industrial profits averaged nearly 10% of GDP during Mr Xi’s first five-year term, the highest since China’s economic reforms began four decades ago. The party could yet use its cells as beachheads for more control. Regulation of tech firms may get more intrusive. Feeling vulnerable, many of China’s wealthiest entrepreneurs hold foreign passports. But the party knows that a healthy economy needs a vibrant private sector. Perhaps the biggest risk is that, even if Mr Xi means well, the accumulation of so much power in one leader can itself have a chilling effect. A few days after his baijiu remark, the distiller announced that it would sell a new blend at 30 yuan a bottle. Will the Buck Stop Here? 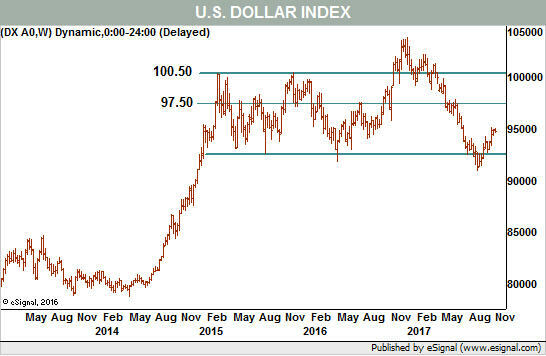 The U.S. dollar is on track to get back at least half of its 2017 slide.. The European Central Bank announced two weeks ago it would cut the level of bonds it purchases every month but extend the length of time it would continue to buy them. That sparked an upside breakout in the U.S. Dollar Index and gave the dollar bulls room to run. In round numbers, the greenback targets 97.50 from current 95.00. That may not seem to be much of a move, but in the currency markets it is significant. The dollar is down 12.4% from its Jan 3. Peak to its Sept 8. low—and is still down 8.8% year to date. The U.S. Dollar Index tracks the dollar’s performance versus a trade-weighted basket of other currencies; the euro represents 57.6% of its value. Since movements in the dollar are usually the inverse of movements in the euro, it was clearly the euro weakness after the ECB announcement that triggered the dollar’s breakout. The dollar also looks strong against other currencies in the basket, including the Japanese yen (13.6% weight), Canadian dollar (9.1%), Swedish krona (4.2%), and Swiss franc (3.6%). Thanks to the ECB news, the chart of the dollar index shows simultaneous upside breakouts Oct. 26 from two distinct technical features (see Chart 1). Investors can also track the dollar’s performance with the PowerShares DB US Dollar Index BullishUUP in Your Value Your Change Short position exchange-traded fund (ticker: UUP). The first feature is the declining trend drawn from March of this year. Admittedly, the line I drew is somewhat subjective, as it missed a few of the data points normally included. Yet the spirit of the line is sound, so the conclusion of a breakout is valid. There are other wonky technicals that foreshadowed this breakout, including a failed breakdown below long-term chart support in September and rising momentum readings over the past few months. Chart watchers use the size of technical patterns to forecast likely targets once the breakout occurs. Measured from the lowest point in the pattern to the neckline, the pattern measures approximately 3.10 points. Add that to the breakout point, at 94.40, to get a first upside target of 97.50. 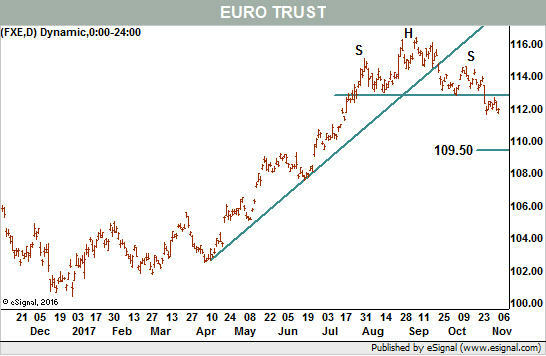 The euro shows the opposite trend, with a breakdown from its own head-and-shoulders pattern (see Chart 2). 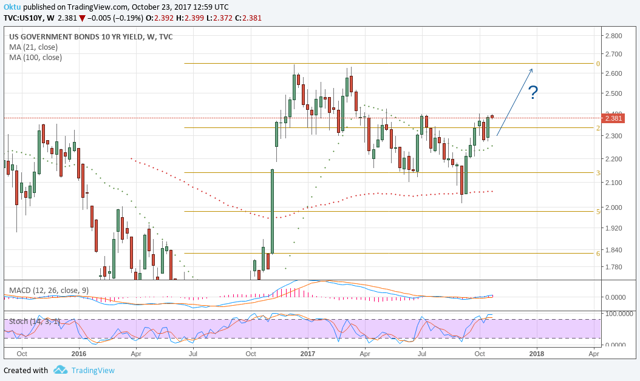 Using the CurrencyShares Euro TrustFXE in Your Value Your Change Short position ETF (FXE) as a proxy, the breakdown targets the $109.50 level from its recent price of $111.90. Proving that the euro and dollar index are not exact opposites, the trendline in the euro ETF is much less subjective in terms of its construction. This line broke to the downside in September. The time frame for these moves is on the order of weeks, and is relatively short-term in nature. But there is an argument for a longer-term move. For the dollar, there was a trading range in effect for the past few years, with the notable exception of the September false breakdown and the much longer-lived false upside breakout late last year (see Chart 3). 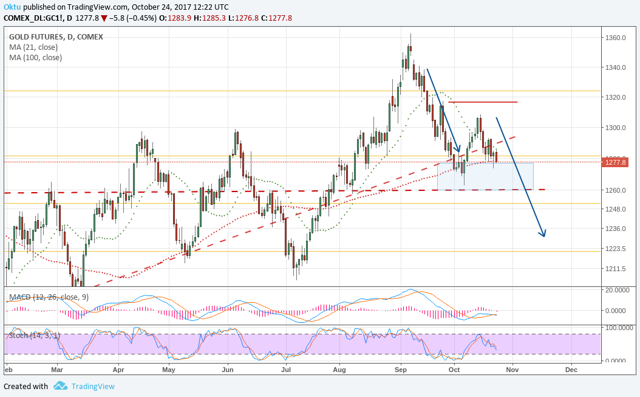 Should the short-term rally reach its target of 97.50, we can reevaluate to see if the dollar is strong enough to target the top of that former range in the 100.50 area. 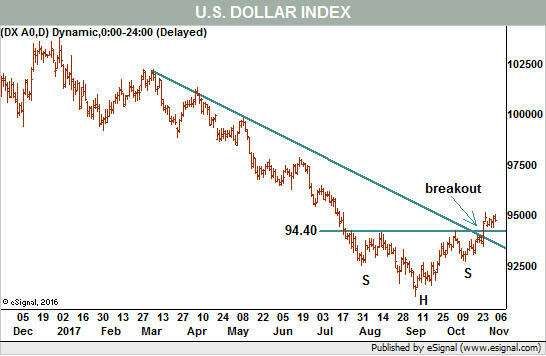 Let’s make that call if and when the dollar reaches 97.50. The only major currency that is currently beating the dollar is the cryptocurrency bitcoin, but that deserves full treatment in another column. 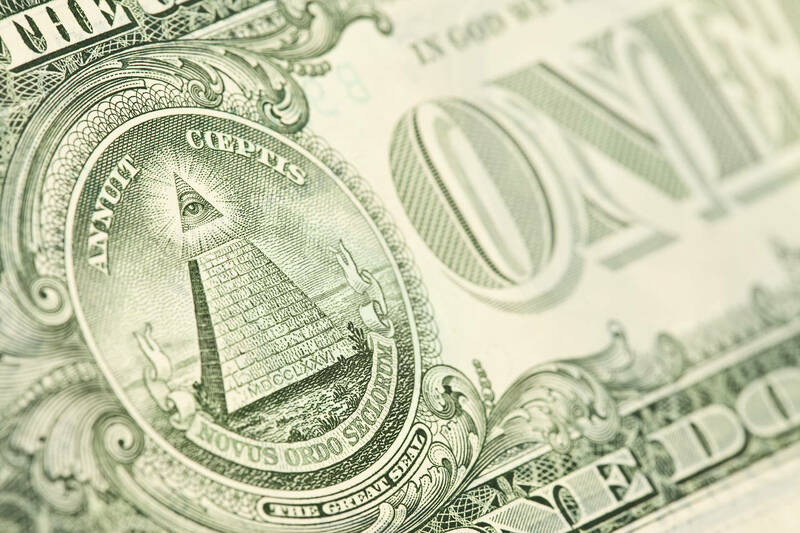 For now, the dollar seems to be the fiat currency of choice among the major currencies—and even among emerging currencies in Brazil, Turkey, South Africa, and Russia. Michael Kahn, a longtime columnist for Barrons.com, comments on technical analysis at www.twitter.com/mnkahn. A former Chief Technical Analyst for BridgeNews and former director for the Market Technicians Association, Kahn has written three books about technical analysis. Forget Yemen, Syria and Lebanon, just a few of the countries in which Saudi Arabia is fighting a proxy war with Iran, its long-time enemy. The Saudi royal family now appears to be at war with itself. Regardless of who wins, the conflict could destabilize Saudi Arabia, which was already weakening anyway. What’s happening in the country is the definition of palace intrigue. The king, Salman bin Abdul-Aziz, took the throne in January 2015 following the death of his half brother, Abdullah, a son of the nation’s founder who had ruled the country for two decades. It was a relatively straightforward succession. It’s now common knowledge that it took a behind-the-scenes power struggle for King Salman to crown his son, Mohammed bin Salman, a prince and name him his chosen successor. But on Nov. 4, the power struggle became brazenly public. That day, Salman and his son had more than a dozen princes and former high-level officials arrested, including a world-famous billionaire. The reason for their detention is simple: Salman is trying to remove obstacles that could prevent Mohammed bin Salman from succeeding him. King Salman is the first monarch in the history of the modern kingdom to buck this particular tradition. Usually, a successor is chosen by consensus among the sons of the founder of the kingdom. But now that the second generation is nearly all dead, and now that there are too many third-generation princes to convene, it has become more difficult to choose who will become the next king. He has bucked other traditions too. Salman has strengthened his son’s claim by bestowing on him sweeping powers over security and economic affairs. Mohammed bin Salman is the defense minister, the head of a strategic economic council, controller of Saudi Aramco and, after Nov. 4, the chief of an anti-corruption agency. And Salman did all this by removing from power his half brother and his nephew, both of whom were crown princes. He has also sidelined powerful members of the clerical and tribal establishments. Some rumors suggest that the purges were made in response to a plot against Mohammed bin Salman. It’s unclear if that is actually the case. But whether the rumors are true or whether the arrests were pre-emptive, the outcome is the same: There are fewer threats to a Mohammed bin Salman reign. One of the princes arrested, Mitab bin Abdullah, for example, was the minister of the National Guard – the parallel military force to the regular armed forces under the Ministry of Defense. He and Mohammed bin Salman shared responsibility for Saudi Arabia’s armed forces. Until Nov. 4, that is. Mitab’s brother, Turki bin Abdullah, was also arrested. (He was removed from his post as governor of Riyadh in 2015, the year King Salman took the throne.) Perhaps the most famous target was Prince Alwaleed bin Talal. He is an entrepreneur who is mostly disinterested in politics, but his father is a known liberal who opposed Salman as king and now opposes Mohammed bin Salman as his successor. Arresting these individuals accomplishes two things. First, it guarantees their capitulation to Mohammed bin Salman. Second, it gives the Salman faction more mileage out of the anti-corruption drive. Between that and their calls for a more moderate version of Islam, the king and his son are moving away from the traditional sources of support (clerics and tribal establishments) and toward new ones: popular appeal among the country’s youth, which makes up about two-thirds of the population. The old guard is an obstacle for the reforms needed to move the kingdom beyond its current impasse – put simply: depending almost solely on oil revenue – and thus a threat for the leadership. They are using populism to inoculate themselves from the potential consequences of their power grab. In the process, though, they are inadvertently laying the foundations for the next crisis. Relying on popular support means they will be forced to enact more reforms than they actually want to – or are even capable of. Despots who try to be populists usually end up being neither and, in their failure, lose power. 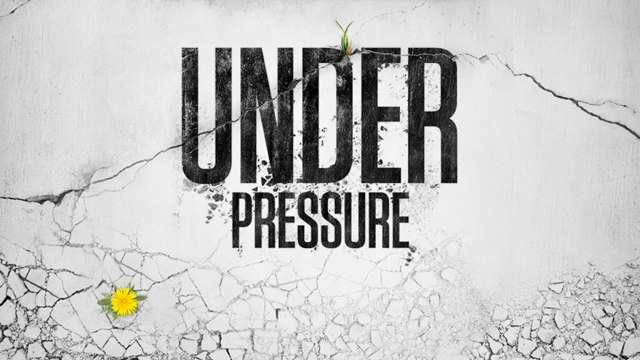 It is too early to tell what will be the outcome of the power struggle. Whoever comes out on top will be unable to ignore the fact: that Saudi Arabia is a country in decline, largely because of low oil prices but also because of the general disarray in the Middle East. In this context, then, the events of Nov. 4 are more than petty power grabs – they are attempts to make the country pliable enough to accept necessary reform at a time of increasing regional chaos. The kingdom cannot both change its nature and hope to meet the external challenges at the same time. It has to consolidate at home before it can act effectively beyond its borders. But this sequence of priorities is not a luxury that the Saudis enjoy. Their historical enemies the Iranians are gaining ground, and they cannot simply focus on domestic politics. Take, for example, another thing that happened Nov. 4. The leader of Riyadh’s main proxy in Lebanon, Prime Minister Saad Hariri, resigned after criticizing Iranian interference in his country. By having Hariri pull out of the coalition government in Lebanon, the Saudis hope to weaken Iran’s premier proxy, Hezbollah, which benefits from the coalition government in Beirut. But it’s a weak and probably ineffective move. Now that the Islamic State is weakened, Iran has the advantage in Iraq and Syria. Riyadh’s inability to deal with external threats, if anything, will only intensify its domestic ones. Even though the king and his son have the upper hand, an inability to effectively counter the Iranian threat could weaken their position at home and thus aggravate the infighting. 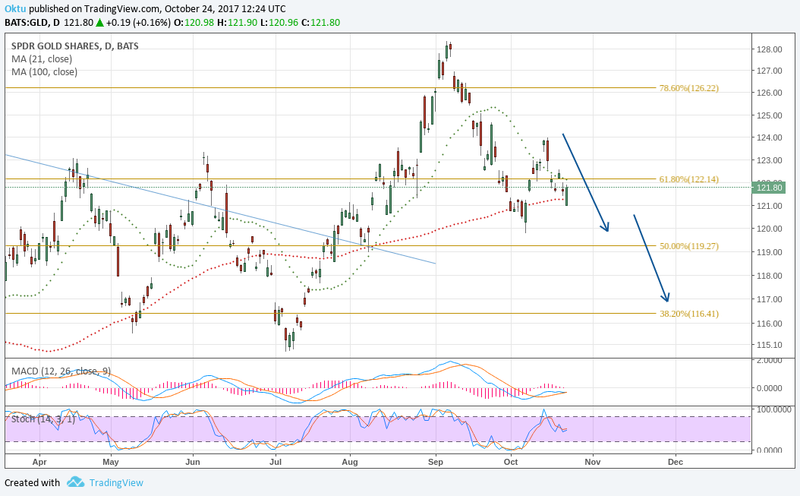 - The UST 10-year yield is likely to continue growing, which is a key pressure factor for the gold price. - The geopolitical risks are becoming less relevant. 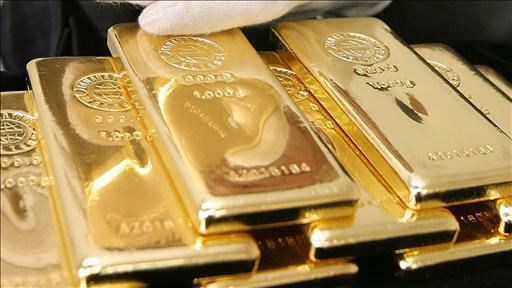 - While the gold price is growing, the hedge funds are selling. 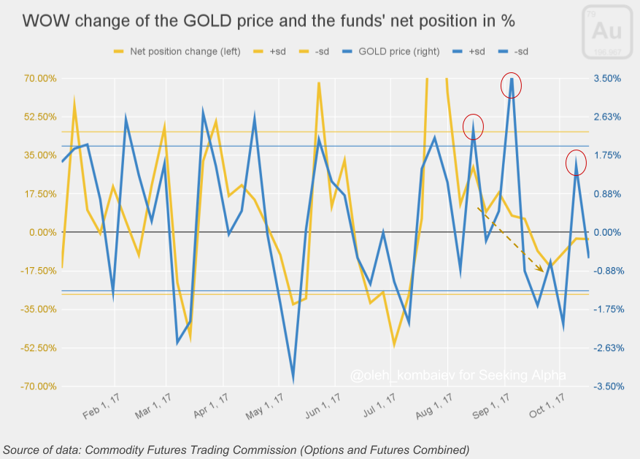 The power balance in the gold market leans toward the bears, which implies a continued reduction in both gold and the SPDR Gold Trust ETF (NYSEARCA:GLD) (a fund that tracks the price of gold) prices. 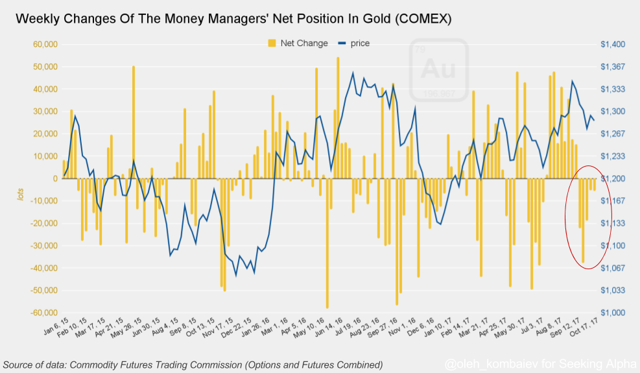 In the short term horizon, the gold price will remain virtually tied to the level of the U.S. real interest rate, and, therefore, in this analysis, first and foremost, attention should be paid to the dynamics of UST10. Let's take a look at the factors that trigger this growth. 2. Apparently, John Taylor who advocates tighter monetary policy seems to be the most likely candidate to replace Janet Yellen. 3. The U.S. Senate has adopted the budget for 2018 that could be considered a step towards Trump's fiscal reform. 4. Both direct and indirect indicators confirm the strong growth of the U.S. economy in the Q3. For example, the economists of Societe Generale predict that the first annualized estimate of GDP for Q3 2017 will reach the level of 2.6% on October 27. I'm sure that in the next month the listed factors will contribute to the increased profitability of UST, which in turn will negatively affect the gold price. 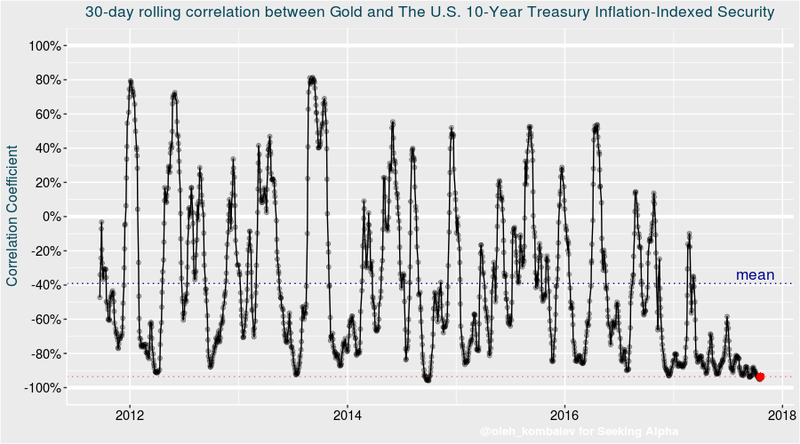 In the previous post, I've proved statistically the sensitivity of gold to the geopolitical risks, in particular to a possible escalation of conflict between the United States and North Korea. I believe that the real risk of escalation remains low. As for the funds' actions, I also do not see anything that could imply the formation or at least expectation of the bull trend in the gold market. Let's start with the most obvious. During the past five sessions, the funds have been continuously reducing the long positions in gold. 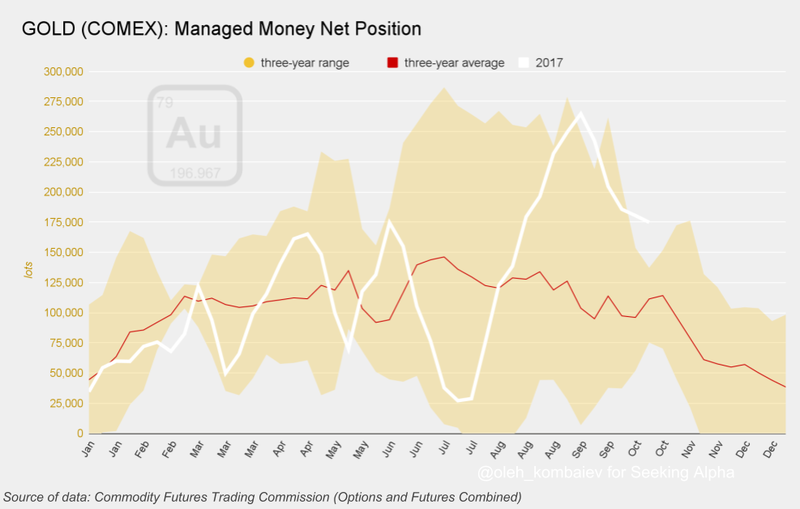 It is particularly important that during the latest reporting week, the funds shifted from closing the long positions to building the short ones. 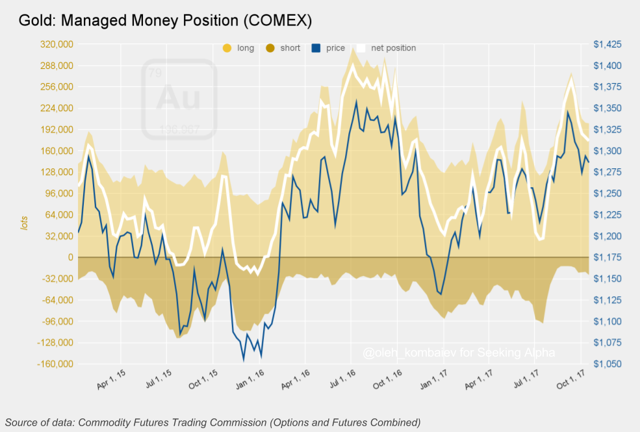 In total, the funds have sold 91,174 contracts over the past five weeks, which is approximately a half of their current net long position. I would also like to draw your attention to the lack of synchronization between the actions of funds and the dynamics of the gold prices, which also does not look like the bullish market. The funds were selling in the growing market - it is clearly a negative sign. So, we see that: (1) the dynamics of the U.S. real interest rate remains the determining factor in the gold market, and a number of assumptions related especially to the probable future monetary policy of the Fed allows to expect further growth rates, which is negative for gold; (2) the geopolitical risks support the gold market, but their relevance reducing; (3) the actions of funds at least do not support the gold market. 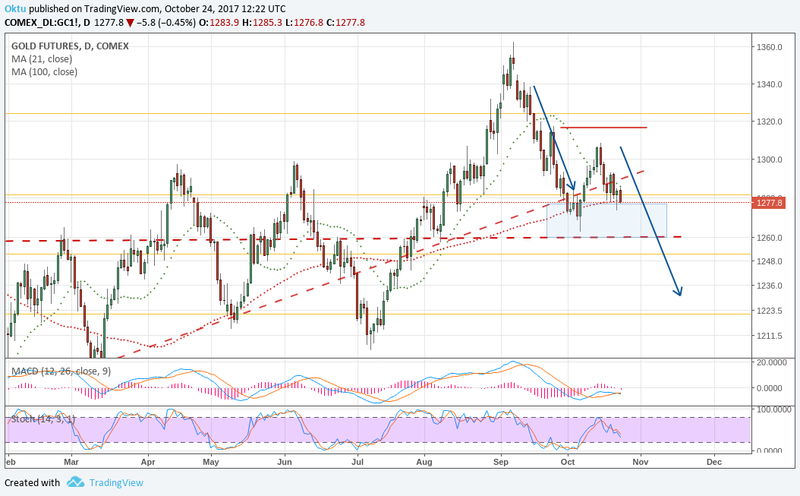 All the above considered, my forecast remains the same - the gold prices will decrease to a level of $1,230 in the next two months. Applying the foregoing to the dynamics of the SPDR Gold Trust ETF, I expect the fund price to drop to $116 and below in the next 60 days. SEOUL – Could the world soon witness another devastating war on the Korean Peninsula? That question looms large in many conversations these days. Of course, concerns about the North Korean regime’s nuclear-weapons program are nothing new. The United States first tried to resolve the issue back in 1994, with the US-North Korean Agreed Framework; but that effort gradually collapsed, owing to actions taken – and not taken – on both sides. Then, in 2006, Kim Jong-il’s regime detonated North Korea’s first nuclear device, and put the issue squarely back on the United Nations Security Council’s agenda. In the ensuing decade, North Korea has conducted five more nuclear tests – most recently in September – and demonstrated the technological mastery needed to develop advanced thermonuclear weapons. 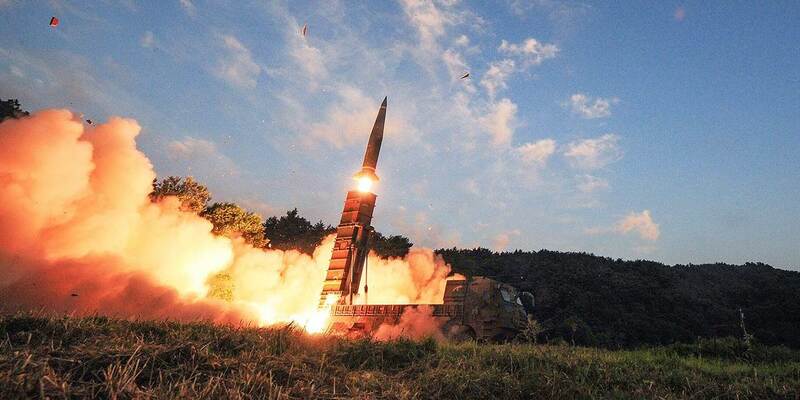 And, under Kim Jong-un’s leadership, the situation escalated further when the regime began making significant progress toward developing an intercontinental ballistic missile (ICBM) capable of reaching the US mainland. And this development coincided with the arrival of US President Donald Trump, who has promised a new approach to global affairs. North Korea has made clear its commitment to developing a long-range nuclear-strike capacity. In the regime’s view, nuclear weapons are its only insurance against attack. Without them, Kim believes, he would share the fate of others who abandoned their pursuit of nuclear arms, such as Saddam Hussein in Iraq and Muammar el-Qaddafi in Libya. In this context, the US objective of a denuclearized North Korea disarmed of ICBMs is unachievable by diplomatic means. And, at any rate, Trump has declared diplomacy a “waste of time,” and ominously warned that “only one thing will work,” though he hasn’t explained what that means. Given that neither the US nor North Korea has shown any enthusiasm for talks, one could conclude that war is inevitable. Yet, for all its bellicosity, the North Korean regime is unlikely to start a full-scale military conflict, because that would surely spell its demise. At the same time, the US has no good first-strike options. Surgical strikes may sound promising, but they are hardly foolproof. As US military commanders well know, strikes that failed to eliminate all of North Korea’s nuclear weapons at once could trigger a regional – or even a nuclear – war costing millions of lives. In the US, those who argue for military action often claim that deterrence will not work against an “irrational” regime. But there is no reason to assume that Kim is bent on mass suicide. After all, when Mao’s China made a dash for nuclear weapons in the 1960s, its rationale was little different from that of North Korea today, but no one doubted that deterrence would work. Still, even assuming that deterrence – embodied in Trump’s threat that the US will “totally destroy” North Korea – does work, it will not prevent a nuclear- and ICBM-armed North Korea from fundamentally altering the strategic calculus in northeast Asia. The US nuclear deterrent protects the US first and foremost. It remains to be seen if US “extended deterrence” will continue to protect American allies such as South Korea and Japan. If the US mainland becomes a potential target for a North Korean nuclear strike, then the credibility of deterrence could depend on whether the US is willing to sacrifice San Francisco to save Seoul or Tokyo. Doubt about the US nuclear umbrella in the region could lead South Korea and Japan to decide to develop their own nuclear options. In fact, South Korea had a nuclear-weapons program long before North Korea. That program was abandoned when South Korea signed on to the Nuclear Non-Proliferation Treaty in 1975, but restarting it has become a subject of debate in Seoul. Needless to say, further nuclear escalation on the Korean Peninsula would be very dangerous, not least because the Kim regime would feel even more threatened than it already does. So far, the US approach to North Korea has been to tighten sanctions and outsource the problem to China. But while China does have strong economic ties to North Korea, it is unclear whether China has the clout to change the Kim regime’s behavior, even if it wanted to. Success would probably require something close to regime change. It is thus unwise to rely wholly on China. Clearly, a broader diplomatic approach is needed, and it should start by addressing a fundamental issue at the heart of the problem: namely, that no peace treaty has ever been signed to end the 1950-1953 Korean War. A dialogue to replace the 64-year-old armistice with a formal peace agreement could pave the way for broader discussions about nuclear escalation and other threats to regional stability. And, at a minimum, it could break today’s diplomatic stalemate and give the parties involved more reason to refrain from further provocations. More broadly, a new round of diplomacy would have to address North Korea’s security concerns, and provide space for the North to evolve politically and economically, as China has done over the past few decades. This may seem like a distant prospect; but if the security situation on the peninsula is resolved, it would not be out of the question. The alternative is to continue on the current path and risk a military conflict or a full-scale war. Even if those worst-case scenarios were averted, the region would have nothing to look forward to but instability for years to come. Carl Bildt was Sweden’s foreign minister from 2006 to October 2014 and Prime Minister from 1991 to 1994, when he negotiated Sweden’s EU accession. A renowned international diplomat, he served as EU Special Envoy to the Former Yugoslavia, High Representative for Bosnia and Herzegovina, UN Special Envoy to the Balkans, and Co-Chairman of the Dayton Peace Conference. He is Chair of the Global Commission on Internet Governance and a member of the World Economic Forum’s Global Agenda Council on Europe.